I've noticed that some cyclists who have been introduced to the concept of the rate of climbing uphill falsely think that Michele Ferrari pulled this out of his own pocket, as in, he invented it or something of that nature. Negative. He only went ahead and popularized the idea, putting a confusing trademark name to it such as "VAM" and developing some of his own methods to look at it with respect to cycling performance. But the idea itself is rooted in centuries old elementary geometry and Newtonian physics. Click here for the history of vectors. Let's have some *serious* fun with climbing rate. You'll start to see simple relationships that may finally make some sense to you as a cyclist. If you love analysis, this may be for you. I'll show 5 different ways to study vertical speed, or rate of climbing. 3 of them are using math. The 4th involves using some field work with math. I'll show you what Tom Danielson's climbing rate was for the record ascent up Mount Washington and I'll also show you an error analysis done on it with an example, which is pretty important on anyone's estimations. Finally, the 5th method shows how using some devices do this all for you instead of number crunching. Let's begin. Enjoy over a cup of tea. If you see something fishy, I welcome you to call out any errors in the proceedings. Vg= ground speed (meters per second). G = grade of hill, expressed as a fraction = (Rise/Run). To see a graphic of what rise and run mean, click here. This is only power for climbing and does not include power to overcome wind and rolling resistance, drive-train losses or power for acceleration. To put into perspective, at a steady 10% gradient, error % between the small angle approximation of (Rise/Run) and the real formula above is about 0.5%. At a steep 20% grade, it is 1.9%. At a near to impossible 30% grade, it is 4.2%. At a vertical asphalt of 45% grade, the error is way off at 9%. Now if I were to take the above power equation and break it down into 2 little packages, here is what each package would mean in a practical sense. In other words, power equals the product of a force (total weight acting downwards) and vertical speed, which in other words is the rate at which you cover vertical distance. Let's take the second package, the climbing rate. This is it. Its a beautiful equation. Its units are in meter/second and you can convert it to meter/hour. 1 meter/second = 3600 meters/hours. Its also called VAM by Ferrari, which may be a pretty confusing term to people. Fig 1 : The Climbing Rate Curve for a ground speed of 1 m/s. Cyclists climbing on human power alone can only use a tiny portion of this curve above y=0, ranging from 0% grade to 40-45% grade. In the linear yellow region, any point on the curve can be given by the equation (rise/run) with negligible error. I have chosen about 10-12% for the upper limit of the linear portion. For any hill grade above this, its better to represent G in the power equation with "Vg.sin[arctan(rise/run)]" than just "Vg. (rise/run)" to avoid errors. Also notice the point on the curve that signifies 45 % gradient. It is impossible to ride efficiently above 40%. After 45% is the curve signifying landslide possibility, which cannot be attempted by any cyclist. This is the upper limit for practical climbing rate. Observe the upper and lower limits of the curve in blue. They are called asymptotes because the curve tends to approach towards them but never reaches -1 or +1. Note 2 : If grade kept increasing and increasing, do you think gravity will actually allow you to keep climbing on your own power? In other words, would rate of climbing keep on increasing with step increases in % gradient, as Ferrari's website may have you believe? Yes, it does. But there's a limit where we can't go further and vertical speed drops to zero. As you ascend uphill your muscles have to supply the power to increase your potential energy. It doesn't come from thin air. Eventually, you will become tired. Your mechanical gearing advantage will decrease as you have a finite set of gears. Your speed will decrease exponentially and at some critically steep grade possibly 40% or more, your velocity will be reduced to near zero and you can roll backwards or fall. It doesn't become efficient to propel yourself anymore. See Fig 2 below. This is why I argued in the past that on very steep grades, it is more practical energy wise to get off your bike and walk. Why? Because the speeds are more or less the same cycling or walking! Note 3 : Human muscular power is also very different from electrical motor power. The capability of a human to deliver bicycle propulsion is a function of time before becoming exhausted, also called endurance time represented by the symbol tau (T). Every individual has a power curve (Watts vs Time) that generally curves downwards from left to right. It tells us that high power can be sustained for lesser time than lower (but slower) power output. It is very unlikely that a high climbing rate can be sustained for a very long time through human power alone (unless you're some freak). This can be seen in the graph below. Fig 2 : Pick a certain W/lb and while staying on the horizontal line, notice how your ground velocity Vg decreases drastically as you move towards the sloping lines representing higher grades. In the linear portion of Fig 1, a 10% relative increase in grade in the linear region (say from 7% to 7.7%) should theoretically result in a 10% increase in climbing rate. In other words, climbing rate is directly proportional to the vertical ascent and inversely proportional to the horizontal length of climb. So if we kept ground speed and run constant, a higher rise leads to higher climbing rate and vice versa. Say we doubled the ascent, then climbing rate is double the initial rate. Conversely, if we kept ground speed and rise constant, a longer length of climb will decrease climbing rate or vice versa. Say we doubled the length of the climb, then the climbing rate is halved from the initial rate. If we halved the length, the rate is doubled. Outside of this linear curve after about 10% gradient, a 10% relative increase in grade (say from 17% to 18.8%) should only result in a 3.8% increase in climbing rate. So even though climbing rate increases, it doesn't increase as much due to the nature of the curve above. You can see how its trying to level off. We can take the profile information of the ascent to the ski resort of Arcalis and compute our climbing gradient for each kilometer using kilometer specific gradient and kilometer specific ground speed. The grade isn't steep, hence you can use G = (rise/run). Fig 3 : Km by Km Calculation Of Climbing Rate. Click to zoom in. If you remember some vector theory, you know that any vector can be resolved into component vectors. 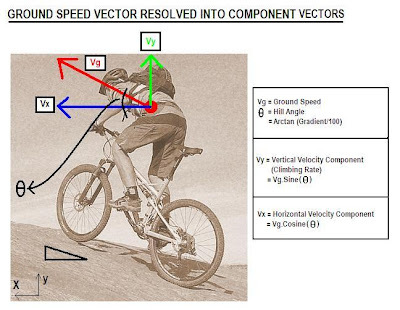 In our 3-D world, the velocity vector of a cyclist uphill can be resolved into an x-component, y-component and z-component velocities. For the sake of simplicity, if we looked at it in 2-D, it would look like the following. The upward velocity component is the climbing rate or vertical speed. Refer to the equations on the right side to solve for these Cartesian component vectors. Fig 4 : Resolving Ground Speed. Click to zoom in. Try to visualize this picture of blue, red and green arrows in your mind as you imagine the cycling moving uphill. The length of each vector signifies the magnitude of the speed. As the cyclist changes speed or accelerates, the length of the ground velocity vector changes in real-time and so will its components since they're all connected. Once the cyclist approaches the downhill section over the other side, the direction of ground velocity vector points downward and its length increases because of the action of gravity and the quickening of pace (until terminal velocity is reached or above). The vertical component will then point directly down and its length signifies the descending rate. Note 4 : In the real world, since we have a third vector for the lateral swaying/zigzagging motion as you climb a hill, the climbing rate calculated from 2-D resolution of vectors would be some percentage off from the real value. This is the error resulting from simplification. Suppose you don't care for any of the above nonsense to calculate your climbing rate, you can still find it out using your time. Go out to a climb like Mt. Washington in the United States and time yourself using a stopwatch. For example, back in 2002, Tom Danielson set an unbeaten record of 49'24" for the 1432m ascent at 11.9% ave.
Plug in what we know for Mt. Washington. Ascent = 1432 height meters. Climb time = 49.4 minutes. Tom's VAM estimate from time comes out to 1739 meters / hour. If you want to break his record, you need to aim for round about this vertical speed. Else... you can sit at home and eat ice cream. Now we all are human beings. Our stop watches are not very precise instruments. And when someone tells you that the ascent in meters of a mountain is "x", what is the error in it and how does it propagate into the final climbing rate calculation based on Method III? δTime = Error in time measurement on a device. What this is telling us is that because of the uncertainties in the vertical rise of the climb and time taken in our example, the uncertainty in Danielson's climbing rate (or VAM) is 103.8 m/hour. The relative error is then a 6% error in the initially calculated figure of 1739 m/hour. This is just an example, mind you. I did not declare that someone estimated the ascent 50 meters off the real value. Yet, this shows that its important to do an error analysis on anyone's climbing rate measured out on the field. Michele Ferrari does not show an error analysis on his data presented on his website concerning this year's Tour de France. People are bound to look at inflated values and declare, "HE DOPED, HE DOPED!! CATCH HIM!" If you still want to dig deeper into some relations using the power of partial differential equations, see Dan Connelly's page on an analytic treatment of climbing rate. You get more mathematical ideas and can do more cool things with it. Dan is a semiconductor engineer from California and like all engineers, loves his number crunching. If you think math and science are beyond you, then spare some coin and try a nifty little device called a variometer, or vario for short. Paragliders use wrist-mounted variometers to check their vertical speed and altitude. This is an expensive but lightweight gear. It uses electronic pressure sensors to sense the change in pressure around them. Since there is a correlation between pressure and altitude, it is possible to calculate instantaneous rate of ascent or descent. For example, between the foot and the peak of the Arcalis climb, there is approximately 0.08 kg/cm2 of pressure difference. The one shown in the picture, made by a company called Ascent, displays vertical speed with adjustable averaging (m/s or ft/min). Its resolution is 0.1 meters/s or 360 meters/hour. It can record data for 200 'flights' and has a rechargeable lithium-polymer battery with life of upto 10 hours or 4 hours standby time. Because a cyclist's vertical speed range is so small in comparison to a paraglider (the speed range of a paraglider is typically 20,000–60,000 metres per hour), such a device may even be impractical. Here's a video of how it works. I have not used one so it'll be interesting to find out whether they work in any useful manner for a cyclist. Another option is the Avocet Vertech II Alpin which is built for mountain hikers. It is claimed it can show you current climbing rate of range 0 to 28,000 feet per hour in with 100 ft/hour resolution or 30 meters/hr. See other features here. A reader also commented that Mavic's Wintec Ultimate cyclocomputer that costs about $200 can also show you vertical climbing rate, but I cannot confirm this. This is a good explanation of vam. I wish my power meter had the capability to toss a km by km of my vertical ascent into the computer. Perhaps that would tell me how the gradient of the climb changed and compare it to my heart rate and power output. Would make it very interesting. Hmm...I don't get understand this this thing. You say from the power perspective that climbing rate = Speed x [rise/run]. But from the vector analysis perspective, climbing rate is Speed x Sine(hill angle). So that would mean rise/run = sin (hill angle)? Am I right? I'm sorry if you cannot see my problem. Wow, I just realized how much I forgot a lot of my high school trig. Thanks for this whack on my head Ron!! put out a minimum of 540 watts continuous. "Our human bodies can only use a tiny portion of this curve, ranging from 0% grade to 40-45% grade." I am wondering about the above statement. I has been my understanding that this is not a limit based on the abilities of the human body but based on the amount of friction available between a rubber tire and a road surface (whether asphalt, concrete or packed gravel). As the road grade increases, the amount of friction possible between the tire and the road surface decreases. Even if the bicycle was powered by a motor or engine, the bicycle would still come up to this limit. It is not so much that a human could no longer provide enough force to turn the cranks but that the tires would begin to skid on the road. The only way to exceed the limit to to have a greater transfer of the driving force between the wheel and the surface of the slope. For example, if the bicycle wheels had cogs that meshed into the slope surface (sort of like the cog railway on the west slope of Mount Washington) then the 40-45% limit could be beaten (I believe). Of course, using a human body to propel such a bicycle would result in very low speed that would likely be beaten by a walker/hiker/climber/snail. If you have enough "horsepower" and "thrust" you can send anything up. For example, the Top Thrill Dragster at Cedar Point climbs the 420 feet at an angle of close to 90 degrees! It can achieve this only through the hydraulic launching mechanism that generates 120 mph of speed in under 4 seconds. That takes about 15,000 Horse Power. I and most of the world have yet to see a cyclist climb up a grade of exceeding 40 or 45%. Technically, from the ambiguous way I worded it, you're right...its not so much a handicap of the human body but just a handicap of the human-bike machine to cope with such grades on puny human power alone. Hence for our purposes we are only practically concerned with a portion of the curve that goes upto a grade of 40%. Ah yes, you are correct about the cog railway. I did not mean a cogged wheel bicycle on a traditional road surface, but one a surface that matched the cogs on the wheel, which would unlikely be made of asphalt. Although I suppose it would be possible to create such a surface using asphalt in much the same way that rumble strips are used at the edge of lanes on highways to alter drowsy drivers that they are in danger of driving of the edge of the road. Perhaps I should try and convince the local road authority to build such a road just to test out my hypothesis. Maybe I can find a cogged wheel for a bicycle on ebay! Heh. @ Bikeboy - Thank you !! I didn't bother looking for too many computers that have this feature. I did a search myself on Amazon and found a barometer from Oregon Scientific (http://www.amazon.com/gp/product/B000EGX30Y) that has the same feature. It costs 220dollars. I think any watch with this feature is going to be really expensive. Looks like buying the cycling specific computer is better than a vario, but a vario is what first came to my mind. I'd still like to see if it would work for a cyclist, because varios are specially made to calculate and record your vertical speed. Hmmm....wish I had some spare cash lying around!!! Roads & bike tyres are not smooth & polished steel. Cycle tyres deform into the irregularities of the road surface, forming a cogwheel type effect. Somebody could experiment building an actual cogwheel road & bicycle, but with normal roads, bikes seem to work ok.